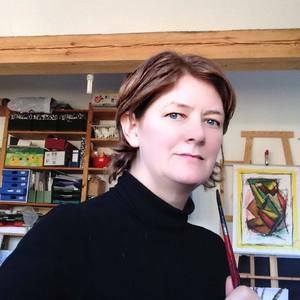 Audrey Reilly lives and works in the Wedemark in northern Germany, but she has also had a previous life in Ireland where she grew tall and studied art. When not experimenting with various painting media or visually studying the intricacies of nature and human nature, she tends passionately to her sprawling garden with her husband, walks her magnificent dogs, and dreams in watercolour. Statement "I immerse myself visually in my immediate surroundings. My subjects spring from the contigous - from the lady at the next table in a cafe, to the pensive stroller on a beach, or to the majestic wonders that throne over the woods in which I reside. I marble the canvas with a wash which I orchestrate and conduct through wet and dry patches creating layer flowing into layer, leaving rivulets of depth. I build up my subject applying acrylic paint with a spatula or pallet knife quickly and spontaneously with little attention to accuracy. The final outline, either in white or black tidies up and contains the subject or object. The contrast and/or harmony between foreground and background fascinates me. Colour that is vibrant and soothing at the same time holds my attention. A finished painting must tease my eye diverting it back and forth between different elements and putting it to work to finish lines and fill spaces. Influences have been my two lives and natural stone. ."